I left Arizona in mid-April and have spent the last month in Minnesota watching snow melt followed by grass turning green and trees getting leaves. For better or worse, medical stuff has taken a good chunk of my time in recent weeks. The Dog: Abby the Black Lab is 12 years old which is old for a big dog. For the last 6 months her breathing has been loud with occasional gagging and coughing. It turns out that she has chronic bronchitis which is kind of like COPD for dogs. Her treatment? A steroid inhaler. The vet told me that I could check out prices locally but recommended that I buy the inhalers from Canada. Sounds familiar for those of us on insulin…. One inhaler at Costco. $369. One inhaler from Canada. $69. My understanding is that while it is illegal to import prescription drugs from Canada, the ban is not being enforced. I am not losing sleep over the threat that I could go to jail for importing medication for my dog. Dr. Google mentions that canine patients can be “uncooperative” when dealing with inhalers and the Aerodawg chamber. Well, duh. Pump Supplies: More than once I have written about my need to change infusion sets every two days. I had always received sufficient supplies with no problems until 2018. I recently criticized CCS Medical for being less than helpful in resolving the problem and switched to another supplier. Meanwhile reflecting the power of Social Media I received a call from a customer service supervisor at CCS and I suspect that she would have helped me to navigate the process. But I was several weeks into working with Solara Medica and it didn’t make sense to go back to CCS. I did eventually get my 45 infusion sets from Solara but it wouldn’t have happened without my bulldog sales rep Stephanie. My endo’s assistant had to submit, resubmit, and re-resubmit medical necessity forms and office notes. The normal 30-day BG log wasn’t enough and I had to provide a 60-day log. Ironically none of the ever-morphing requirements for 2-day site changes had anything to do with adhesive allergies and site infections. I am now good for 3 months and dread starting over again in July. Fiasp: At my April endo appointment, I was given a Fiasp sample. There were no vials available and I took home a yellow and blue 300ml pen with several pen needles. I didn’t do systematic testing to see if Fiasp injections brought down highs better than Novolog, but I assume it did. I filled a pump cartridge and started using it in my Tandem X2 pump. Immediately I seemed to have an easier time with my morning BG’s. Unfortunately as others have reported Fiasp seemed to run out of steam on Day 3. By Day 4 my numbers were terrible and I switched back to Novolog. Was this is a fair trial of Fiasp? Absolutely not and it doesn’t matter. Fiasp is not covered by Basic Medicare and I have no interest in paying out of pocket for it. 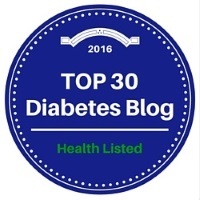 I had to laugh because several times on my blog, I have mentioned that my sister is very adverse to changes in her diabetes care. After a few days of Fiasp I determined that I am entirely too lazy to figure out pump settings to be successful with a new insulin. Meanwhile my sister has switched her mealtime insulin from Regular to Humalog and will be starting Tresiba soon. She is actually considering ordering the Freestyle Libre! So who is adverse to change??? Arthritis: A year ago I wrote that arthritis is the “health problem that most threatens my Pollyanna “Life is great!” philosophy.” My systemic arthritis is well-controlled with NSAIDs, but degenerative osteoarthritis in my hands and feet is relentless. Last week my foot doctor indicated that surgery is the only option for my left foot. I am not totally on board with cutting into my foot. It fixes one joint but I still have tendon and heel problems. And then I have my right foot. Psychologically I struggle with having this surgery because it opens the door to dealing with my other bad joints. There is something comforting with staying with the pain I know and avoiding the pain and unknown results of surgery. I will schedule surgery for mid-August with the option to cancel it. Two weeks on the couch with drugs will be followed by two months in a boot with a knee scooter. In the short run I have abandoned the close-by health club where I enjoy the fitness classes but know that they are not good for me. I have joined the YMCA which has an extensive schedule of fitness and water aerobics classes directed at various levels of senior fitness. Argh! I can’t even stand to write this but I know that I will feel better. Frozen Shoulder: I think that I am in the early stages of frozen shoulder on the right side. I am unfortunately an expert on this condition and on the 4-year plan. I had my first FS in 2001 on the left side. Four years later my right shoulder was affected and four years later the left again. Now it’s back to the right. Only the first one was horrible. The rest have been annoying and long-lasting but not hugely debilitating. Don’t tell me to stretch the shoulder in the shower. As I wrote in 2013, “if you can get rid of your “frozen shoulder” by doing a week’s worth of exercises in the shower, you don’t have adhesive capsulitis.” My experience with frozen shoulder indicates that it is an inflammatory disease-driven condition that is more related to duration of diabetes than A1c levels. Whatever. If you want to learn more about frozen shoulder, check out my “Argh! Frozen Shoulder” blogpost. Summary: That’s it for today. The dog is old. I’m getting older and my feet hurt. So do my hands. I’m a chicken when it comes to surgery but hate the idea of quitting the activities that I love. I had diabetes yesterday and still will tomorrow. But the sky is blue and the grass is green. Life is good. I am a firm believer that food choices make a huge difference in making diabetes easier to manage. I personally cannot eat lots of carb-yummy foods along with bucketfuls of insulin and expect anything other than roller coaster blood sugars. I am not good at moderation and usually do better with none rather than one. I can’t stop at a single potato chip or one chocolate chip cookie. In general I eat a diet that would be categorized as moderately-low carb. I do okay most of the time and then drift into patterns where I’m eating foods that trash my blood sugars. Most of my over-snacking with big boluses is in the evenings and I end up with lows at bedtime followed by 2:00AM spikes. Multiple Dexcom alarms destroy my sleep and blood sugars rebel well into the next day. Before- and after-dinner glasses of wine magnify the blood sugar swings and sabotage any semblance of willpower. Occasionally I need a total reset to break the pattern. For the most part I don’t do diets with names and I have never followed the South Beach Diet or gone Paleo, Keto, Bernstein or Mediterranean. Last spring I decided to investigate the Whole30. The only reason I knew about the plan was that Kelley of Below Seven had blogged about her successful Whole30 experience in February and March of 2017. The Whole30 describes itself as “a short-term nutrition reset, designed to help you put an end to unhealthy cravings and habits, restore a healthy metabolism, heal your digestive tract, and balance your immune system.” I bought the book in May and dove in headfirst. In general I hate to cook but tried a bunch of the recipes in the book. My husband was patient with the whole experience and we quickly agreed that we mostly like meat, fish, vegetables, and fruit with few spices or add-ons. The Whole30 is a do-or-die plan where sugar, grains, dairy, and all sorts of food are forbidden. Interestingly potatoes are allowed and after rarely eating them for several years, they were a treat. I was quickly amazed at how much fruit I could eat with minimal blood sugar disruption. Absolutely forbidden were diet soda and alcohol. I technically flunked the plan on Day 10 when I put lemon pepper on my chicken without knowing that it contained sugar. Unwilling to go back to Day 1 as the plan requires, I continued towards Day 30 as an imposter with lemon pepper on my conscience. All of a sudden on Day 25 I didn’t care anymore. My first sin was Diet Coke and a wonderful carbonation buzz. The second was a glass of red wine. Surprisingly the food restrictions of the plan didn’t bother me much. I had few sugar cravings and my most-missed foods were string cheese and peanuts. I felt little guilt about quitting so close to the finish line because I lacked the conviction that Day 30 was going to change my life. Fast forward to October. After a mostly-okay summer, I was again mired in bad habits. Too much diet soda, too much alcohol, too many snacks. I hit bottom two weeks ago when my husband was out of town and I determined that three old-fashioned donuts (two chocolate-covered and one sour cream) would be an acceptable dinner. You can imagine how well that carbohydrate binge went. Despite massive doses of insulin, my blood sugar soared and crashed all night long. cookbook—Spinach Frittata and Classic Chili—more than once along with basic dinners of meat, vegetables, and potatoes. Mixed nuts and honeycrisp apples have worked great for snacks and bananas, grapes, and juice have combatted the occasional lows. I am not missing Diet Coke which is kind of a miracle. Am I cheating? Yes, but within the ground rules that I established at the beginning of the diet. I use glucose tabs for lows when away from home and obviously they are a big no-no. But they are convenient and “medicinal.” I am also allowing things like lemon pepper and soy sauce which are forbidden. Other than that, I am toeing the line. Will I make it 30 days? Probably not and that is not my immediate goal. I have an endocrinologist appointment tomorrow and that was my original target end date. Unfortunately the donut bender will show up as Day 1 of my 14-day CGM tracings. Other than that, my BG numbers have been good. If I don’t indulge in a post-endo Diet Coke reward, I might keep going for another week or two. Maybe all the way to Day 30…. Is there anything magical about the Whole30? Probably not. It is one of many diets with a rigid no-cheat framework that can help people break bad habits in the short run while providing motivation for the future. It is probably an oversell that it claims to change your life in 30 days. At the same time both of my “almost Whole30” experiences have been successful in steering me back to healthy eating and better diabetes numbers. If you have interest in trying the Whole30 plan, you can explore the website and probably learn everything you need to know. I bought the book at Amazon and haven’t regretted having it for reference and recipes. You should read Kelley’s series of blogposts at Below Seven because she details what she cooked, how she felt, and how it affected her diabetes. And unlike me she made it 30 days without breaking the rules! A final question which I don’t address today is: If following a plan like the Whole30 makes diabetes easier and allows me to almost flatline my blood sugars, why don’t I eat like this most of the time? Good question. I first met Lloyd Mann four or five years ago at a Saturday diabetes meet-up at a local Panera Bread. He was sitting at the end of the table with a big smile, an iPad, and a copy of his book about diabetes. He was discussing the possibility of being tested for MODY because of insulin signaling problems. A resident of South Dakota at that point, Lloyd was in Minnesota visiting family and had previously hooked up with this group through online friend Scott Johnson. Fast forward a couple of years and Lloyd now lives in the town next to me. We have begun to supplement the every-couple-of-months group meetings with one-on-one lunches at the Panera Bread near his home. Yes, our relationship is built on Lloyd’s love of tomato soup and “Scott Johnson-esque” grilled cheese sandwiches along with endless cups of Diet Pepsi (definitely not Scott-inspired but Panera doesn’t carry Diet Coke). Lloyd and I are close in age. In diabetes we are simultaneously far apart and eerily close. Lloyd has Type 2 diabetes and I have Type 1 diabetes. In most ways we are stereotypical depictions of our diabetes types. I was diagnosed with diabetes as a young adult in the mid-1970’s. I was hospitalized in an unquenchable-thirst skeletal state with high blood sugars and large ketones and have never had a day since then without injected insulin. Lloyd was diagnosed with Type 2 diabetes in 1994, took pills for many years, and then started insulin 11 years later. Lloyd’s insulin resistance is off the charts and on a daily basis he uses over 10 times as much insulin as I do. His story personifies the fact that Type 2 diabetes is a progressive disease. So here you have two Medicare people with diabetes. Lloyd uses a Medtronic 723 pump and changes his 300-unit reservoir every day. When his warranty expires in January, he plans to move to a Tandem t:slim X2 pump and continue to change his cartridge every day. He likes the t:slim platform because unlike his Medtronic pump, it allows him to program a bolus larger than 25 units. I use a Tandem t:slim X2 pump. I change my cartridge once a week and rarely bolus more than 2 units at a time. Because Medicare CGM coverage does not exclude people with Type 2, Lloyd is in the process of obtaining a Dexcom G5 CGM. I use a Dexcom G5 CGM. Currently neither of us is using sensors provided by Medicare and we both wear an Apple Watch and carry iPhones. Lloyd and I are technology twins. Lloyd and I are students of diabetes. Yeah, we are “Know-It-Alls.” You may like us. You may find us annoying. But we don’t care. We know our stuff and we want to learn more. I recently asked Lloyd if I could interview him and we met at Panera two weeks ago. I did not record our talk so Lloyd’s answers are in my words with scattered quotations. I also throw in an occasional comment. Lloyd, I know that your diagnosis story is in your book but please give me a short timeline. I was diagnosed with thyroid disease in 1980. Fourteen years later at age 44 I was diagnosed with Type 2 diabetes. What was your reaction was to the diagnosis? I just thought “Oh no, one more pill to take!” Do you have a family history of Type 2 diabetes? Both of my sisters have Type 2 but neither of my parents did. How long have you had diabetes? 23 years. How long have you been on insulin? 12 years since 2005. How long have you been on a pump? Since 2005. Less than one year after starting insulin, I convinced my doctor to order me a pump. I had used Lantus followed by a mixed insulin and wasn’t having good results. I did my homework and presented my doctor with a list detailing why the Deltec Cozmo was the best fit for me. Rather than specify Type 1 or Type 2 in the letter of medical necessity, he just put “Insulin Dependent” and I was immediately approved for pump therapy. I am planning to order a Tandem t:slim X2 to replace my current Medtronic pump. Although the t:flex has a larger reservoir, I prefer the upgrade features, Bluetooth, and CGM capabilities of the X2. I am used to changing my reservoir every day and will continue with that practice. I expect that my total daily dose of insulin will go down using the X2. Tell me about your decision to order a Dexcom G5 CGM. How do you think it will help you? I plan to use the G5 to help reset basal rates. Although I use more insulin now, the basal patterns are the same as I figured out using the Abbott Navigator over 6 years ago. I rarely get lows (insert another exclamation mark here!) but need a CGM for highs. I have always been forgetful and that is increasing with age. My insulin mistakes are almost all related to forgetting to bolus and the CGM will alarm when I forget and my BG soars. I’ve been working with Dexcom since earlier in the summer and I am “waiting as fast as I can” for the arrival of my G5. What year was your book published and why did you write it? Successful Diabetes Management was published in 2011 and I wrote it because I was doing well managing my diabetes and wanted to help others. I chose the cover from Amazon’s stock photos and the image spoke to me as “Follow the Path” to good diabetes management. I had also been one of the many people at Diabetes Daily who knew Richard Vaughn and goaded him to write his book published in 2010–Beating the Odds, 64 Years of Diabetes Health. After Richard’s book was published, he contacted me and said “Your turn, Lloyd”. Lloyd continues his mission to help others with Type 2 diabetes and his Diabetes Daily forum sticky note titled Type 2 in a Nutshell has over 16,000 views. He was previously a moderator at Diabetes Daily. As we consider Type 1 and Type 2, Lloyd, how do you think our diabetes lives are similar? Our daily tasks are the same. We count carbs, we bolus, we deal with highs and lows, we test BG, we change pump sites. And most importantly, we live with fear of complications. What are your thoughts on Type 1 versus Type 2 diabetes? I think that the naming of Type 1 and Type 2 leaves a lot to be desired. Type 1 and Type 2 are based on how you got to where you are but they don’t always address where you are. Type 2’s need to restrict carbs more than Type 1’s and we also have a problem with our livers. Metformin addresses that and I am still taking it after 23 years of diabetes. I think that my diabetes is more predictable than yours. As this stage of your diabetes career, do you identify more with people with Type 1 or those with Type 2? My day-to-day life is like a Type 1. My medical team thinks that I have completely quit producing insulin and that is unusual for Type 2. I have more in common with T1’s than with T2’s on pills. Conclusion: I asked Lloyd if he had any questions for me and he wanted my opinions on hiking and exercising. We talked about lows and he indicated that he used to get lows on older Type 2 medications and when he used to walk a lot. But he has rarely gotten lows since moving to insulin 12 years ago. Sometimes I think that my Type 1 diabetes is most defined by 40 years of lows: while driving, while taking care of my children, while mowing the lawn, while wandering lost at the mall, while peering up at concerned policemen and paramedics. Even with improved CGM technology which now mostly protects me from severe lows, my treatment decisions are always influenced by the possibility of lows and I might argue that’s the biggest difference between Lloyd and me. Do lows make me have the “bad” kind of diabetes compared to him? No, because lows mean that my insulin is working. I can’t imagine the frustration that Lloyd must feel when oral medications in addition to hundreds of units of insulin daily are required to tame his blood sugar. Metabolic syndrome and insulin resistance are powerful opponents and I kind of wonder if my life is easier. When I look at the differences between the types of diabetes, I mostly end up in the “I don’t know” and “I don’t care” camp. I don’t want to fight about labels, blame, stigma, cost, and who’s got it worse. I just want and need the appropriate care for my diabetes and I think that Lloyd would say the same thing. Diagnose me correctly and treat me correctly. That’s not asking too much. In summary, I would say that the most fitting end to this blogpost is that no matter how you look at it, Lloyd Mann and I are just friends who both happen to have diabetes. Types don’t matter.